Life and my Personal Monster(tm) have been especially cruel this year. I had a couple of Big Deals(tm) fall through in Hollywood, the hip thing and sitting in a wheelchair for 8 weeks, and not being able to write or mind the business of writing. 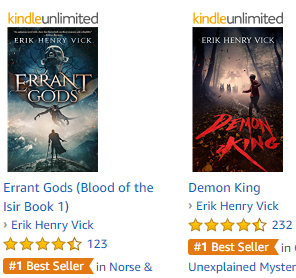 Both Demon King and Errant Gods have the coveted orange dohicky from Amazon!